Home » Pregnancy » Pregnancy Health » Massive Poops in Pregnancy – Are They Normal? There are many things that happen to your body during pregnancy that are sometimes downright icky. Despite the fact they are annoying they are completely normal. Of course, it’s totally acceptable to be a bit worried about certain symptoms from time to time. This is your body and you are growing a baby – it’s normal to want to protect them both as much as possible. One thing which nobody really wants to talk about are changes in the amount of poops during pregnancy. During pregnancy a lot of things about your poop are going to seem unusual, so be ready! The color will alter, it could even turn green! The amount of times you go will change; you might go more, you might become constipated, you might swing from one to the other and not know where you are in the middle of it all. And you might even notice that the sheer amount of poop that is coming out of you increases. Yep. Nobody could ever accuse pregnancy of being lacking in drama! What Might Happen to my Poops in Pregnancy? There are many reasons why your bowel movements are going to totally change during your pregnancy, and it doesn’t matter at what stage you’re at. You could be noticing it straight away as soon as you get that positive test result. 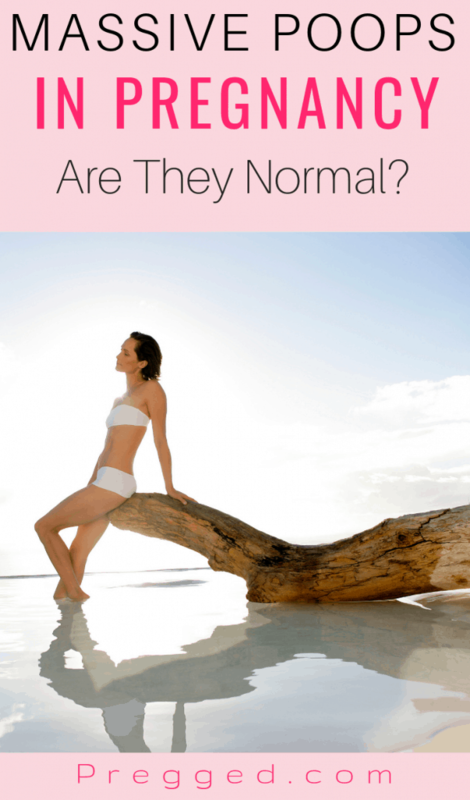 This could be down to nerves, or it could simply be the hormones racing around your body, and there being a slight interim period while your body tries to figure out what on earth is going on! As you move into the second trimester you might notice you experience constipation or you might notice you simply poop more often. Into the third trimester constipation can become a bigger issue, as well as perhaps going more, yet again. Throughout all of this, the consistency could change, the color could change. Basically, you’re going to be more poop-aware than ever before! What nobody really talks about however is the potential to suddenly start expelling massive amounts of poop! But the good news? It’s not actually abnormal. But, Why is All of This Happening to Me? Because you’re pregnant, my love! Your body is figuring everything out, and you’re also likely to be changing your diet to suit the needs of your unborn baby. Eating healthier is a great thing to do, a must do, but it also has the side effect of potentially making you go poop much more often, and probably more in quantity too. Think about all of those fresh fruits and vegetables you’re consuming, this is what happens when you do that! Your body is also running on overdrive, trying to keep you and your baby in stocks of the nutrients that you need. At the end of the day, if all you have to worry about is more poop, you’ve not really got much to worry about at all. If you are eating a high fiber diet, but you’re not getting a lot of fresh fruits and vegetables in there, you should add those in. This could help you with any discomfort you feel when you go to the toilet. Staying hydrated makes everything in your body run smoother, but it also makes the exit of everything smoother too! If you’re worried, or you’re finding that it’s just so uncomfortable when you end up having these massive pregnancy-related poops, talk to your doctor or midwife. Don’t worry about the subject matter, they’ve heard it all a million times before, and your story is no different! There is nothing to be embarrassed about here. A quick five-minute chat could yield the information you need to make everything more comfortable for you, and to alleviate any unfounded concerns you have. It might very well be that when you talk to your midwife or doctor about your diet, they can instantly spot the problem, and you can right it immediately. It might be that you need to be prescribed something to help things along, maybe lactulose. Remember to always check with your midwife or doctor before taking any remedies or medications for anything bowel-related during your pregnancy. The most important thing to take away from this chat is that there is nothing truly to worry about. There is also nothing to be embarrassed about! The fact you’re about to push a baby out of your privates should really take away any embarrassment from talking about any kind of bodily function! We’re all adults here, and pooping is something we all do, no matter what you’ve heard from someone else! Pregnancy is a time of huge rushes of hormones, but it’s also a time when your body is trying to do a million things at once. Your diet could play a huge part in why you are experiencing these rather large-sized poops, but it’s also a sign that your digestive system is working well. Provided you’re not experiencing any blood, extreme pain or difficulty when pooping, then there is nothing to be overly concerned about. If you do notice any of the above get this checked out with your doctor or midwife urgently. At the end of the day pregnancy is a time of the weird and wonderful, so massive poops are really just another thing to accept about pregnancy.